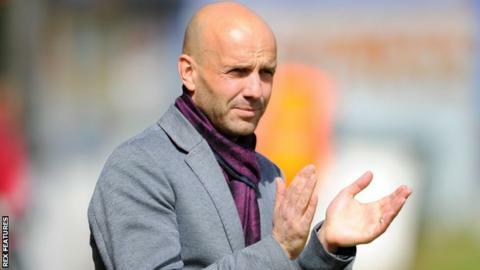 Exeter City manager Paul Tisdale has heaped praise on his side despite losing 4-1 at home to fellow League Two high-fliers Luton Town. The Hatters scored three times in a 10-minute spell after half-time to leapfrog the Grecians and go top of the table as City slipped to third. "It was a fabulous performance which manifested itself in a 4-1 defeat," Tisdale said after the game. "We could play that game 50 times and not have that result." Tisdale felt his side could have easily scored as many goals as their opponents as City failed to win two successive games for just the third time this season. "I've congratulated the players on such a good performance with a five or 10-minute crazy spell which ended in them scoring three goals," he said. "I don't think Luton would have been disappointed if we'd have gone in with at least a couple of goals' lead because we created so many good chances. "We were so sharp today and so intent on scoring we almost tried too hard if that's possible. "If ever there was an example of taking your chances with two teams, and one doing it and one not, today was it."